DETROIT -- The Red Wings have signed free agent right wing Patrick Eaves to a one-year contract. In accordance with team policy, additional terms of the deal were not disclosed. A former first round pick of the Ottawa Senators in 2003, Eaves has played in 242 career games with the Senators and the Carolina Hurricanes. He scored 20 goals in just 58 games in 2005-06, his rookie season in the NHL. Eaves followed his impressive debut with career-highs in assists (18) and points (32) in 2006-07. Patrick Eaves' uncle Murray played for the Red Wings' organization in the late-80s. He amassed 207 points in two seasons at Adirondack. On February 11, 2008, Eaves was dealt with Joe Corvo to the Hurricanes in exchange for Cory Stillman and Mike Commodore. In 85 games with Carolina over the past two seasons, Eaves posted seven goals and 12 assists. In 2005, Eaves was a finalist for the Hobey Baker Award as the top college hockey player in the U.S. In three seasons at Boston College, Eaves totaled 47 goals and 60 assists in 84 games. Eaves, 25, comes from a long line of former NHL players, including his father (Mike) and uncle (Murray). His dad and uncle each played eight NHL seasons. Murray Eaves is a former All-America center at the University of Michigan, who finished his NHL career with the Red Wings in 1990. 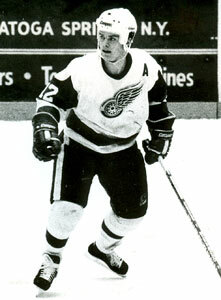 When he was through as a player, Eaves coached in the Wings' organization with Adirondack and Toledo.